Hey, everyone...did you miss me??? I recently did a guest post for the Hardy Plant Society of Oregon and thought I'd post it here as well...I hope you enjoy it! I've been thinking about a post like this (maybe even a series) ever since I got back from my tour with CarexTours a few years ago. 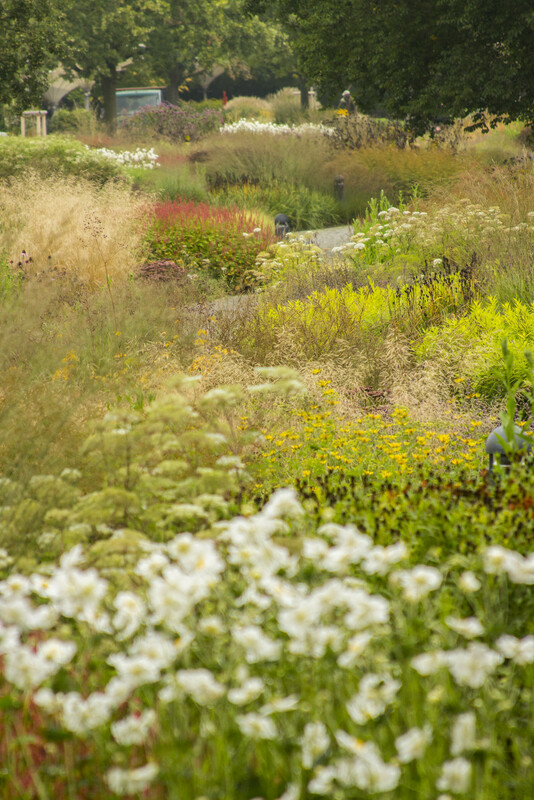 If you ever have a chance to visit an Oudolf-designed garden, either domestically or abroad, you should definitely do it! As gardeners, most of us at some point sort of settle into a certain design aesthetic...sometimes by happenstance, sometimes quite deliberately. One garden style, while not for everyone, is almost irresistible to those with a longing for spaces inspired by nature. 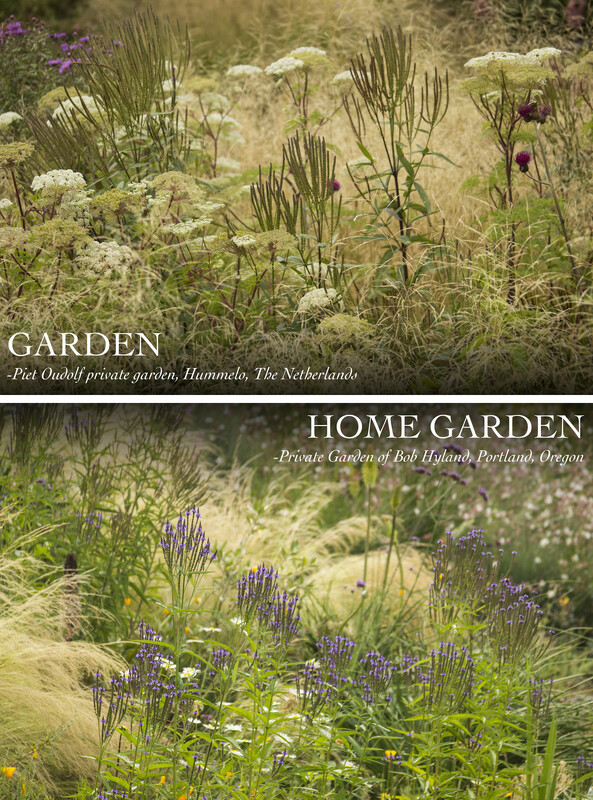 It is the New Perennial Movement, championed by the well-known garden designer, Piet Oudolf. What defines this style...what makes it unique...what is its appeal? 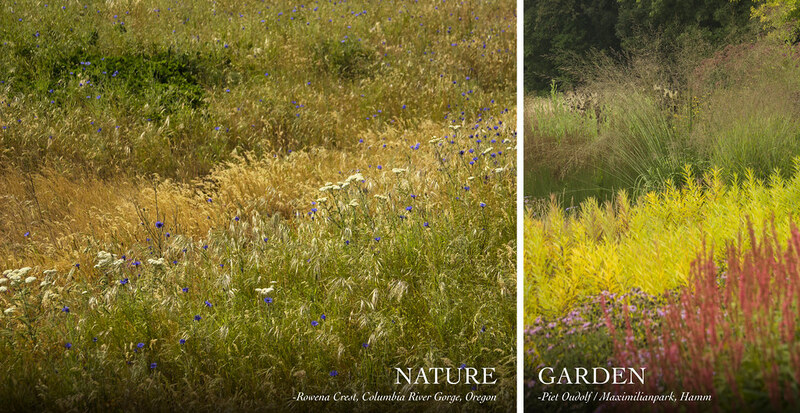 While closely related to the naturalistic style, which often strives to emulate natural plant communities, the New Perennial/Oudolf style is more concerned with capturing the atmosphere of a natural environment. While I consider the style dramatic, compared to many other garden styles, it can seem relatively restrained, so I think of it as "demure drama", more Upstairs/Downstairs than Falcon Crest. 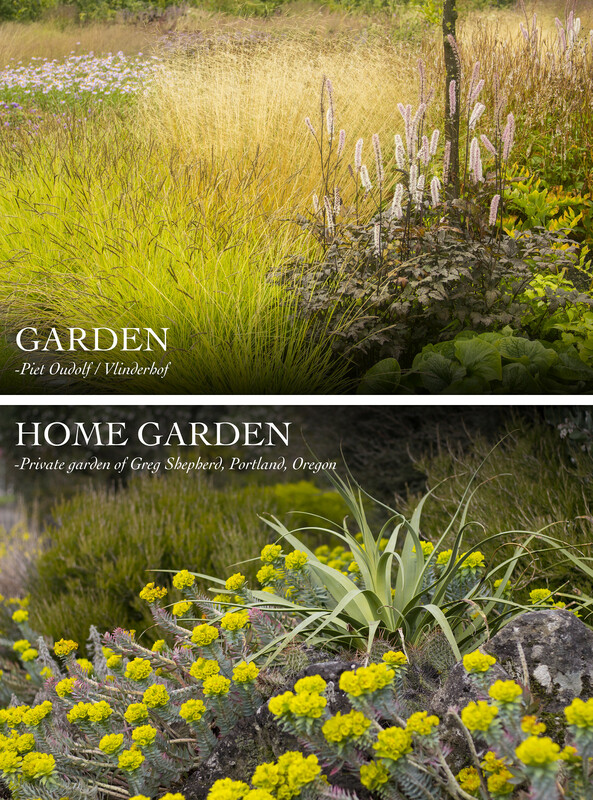 The New Perennial movement embraces any plant that looks good and performs well in context. Preference is typically given, however, to plants that have a more natural appearance, versus an overly-bred hybrid. The closer to the species the better, in general. 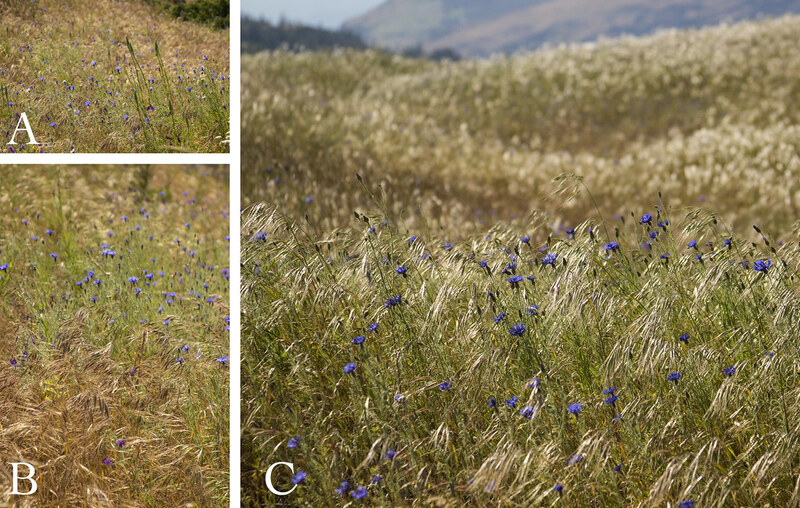 While it isn't trying to recreate nature, natural plant communities are the inspirational jumping off point of the style. The types of plants used, their comparative ratios, and the patterns in which they are placed, are all equally important in this style (and so many other styles, to be sure). 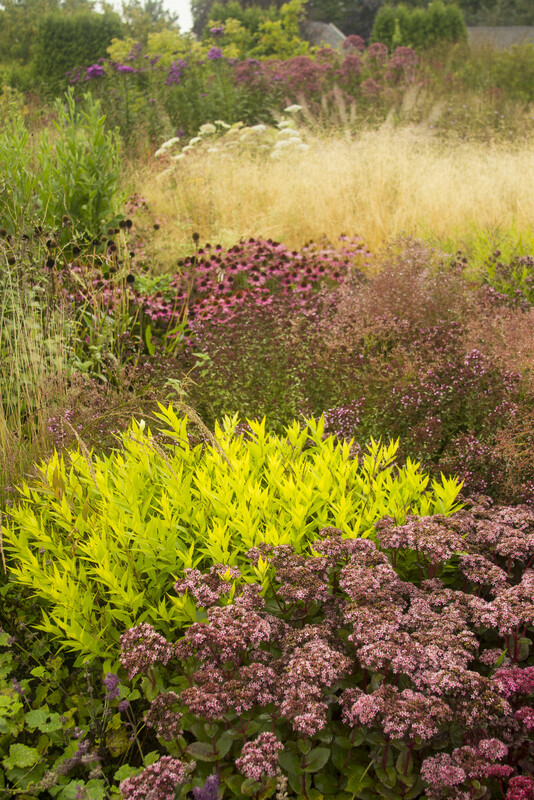 Above is a type of planting combination you can find in most Oudolf-inspired designs. 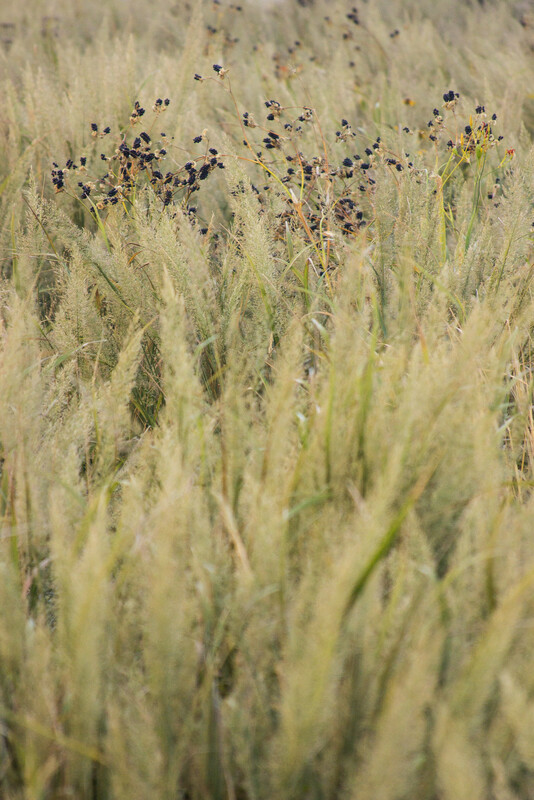 Diaphanous grasses paired with more graphic stems and flowers. On top, at Vlinderhof in The Netherlands, is a pairing of Deschampsia caespitosa and Succisa praetensis. 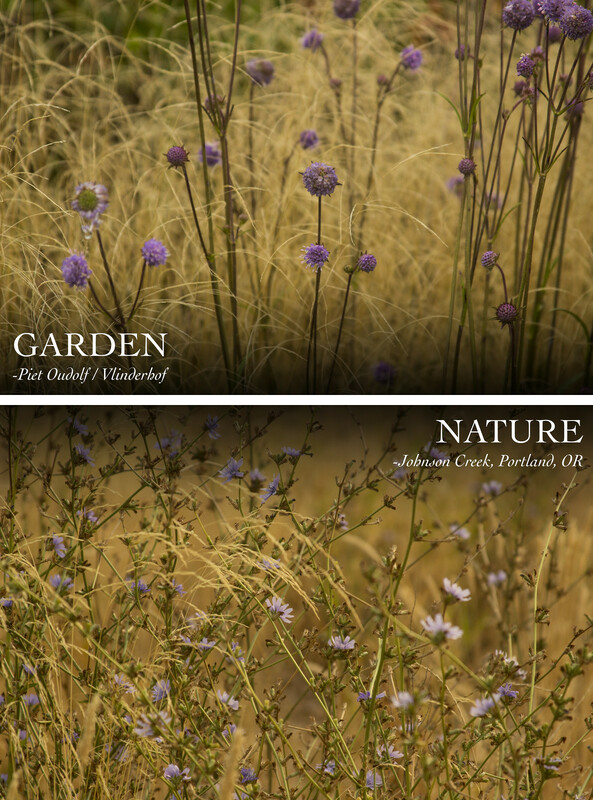 On the bottom, we see wild grasses and chicory in a seeded meadow planting in Portland, Oregon. One pair (semi)naturally occurring, one completely planned...but they could almost function interchangeably in a garden. Sometimes a certain type of plant can be almost emblematic of a style, and, in addition to grasses, I'd argue that Umbels are the go-to plant to create a feeling of wildness. In the two gardens shown above (top and bottom images), the sublimely elegant Selinum wallicianum recalls wild patches of Queen Anne's Lace, so often found in wild areas..and as seen in the middle image. The wide, flat heads of umbels are the perfect foil to the linear verticality of a grass-heavy space. Nothing contrasts better with flat-topped umbels than spires. Their tapering candelabras counter-balance the umbels' horizontality. Both gardens above are using Verbena hastata (or similar), not just for flower color, but for the long-lasting vertical element they will contribute. Also, note again the neutral backdrop created by a veil of tawny grasses. 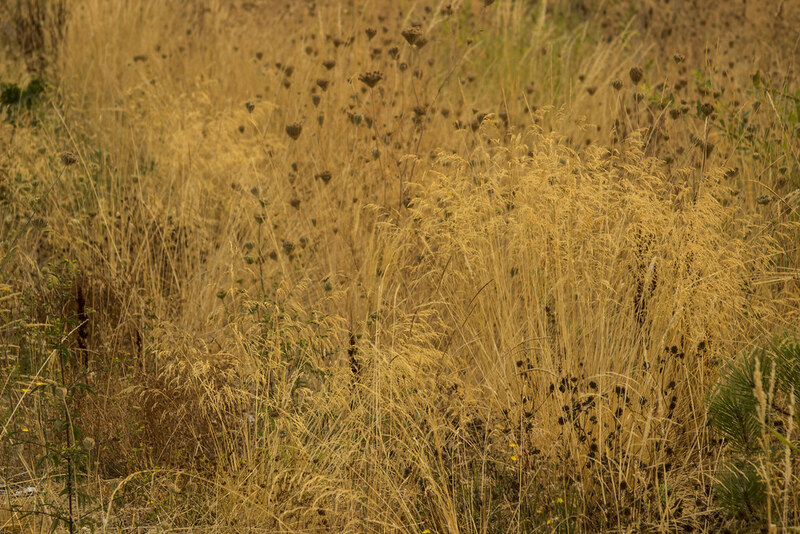 This design technique is a calling card of Oudolf's style. 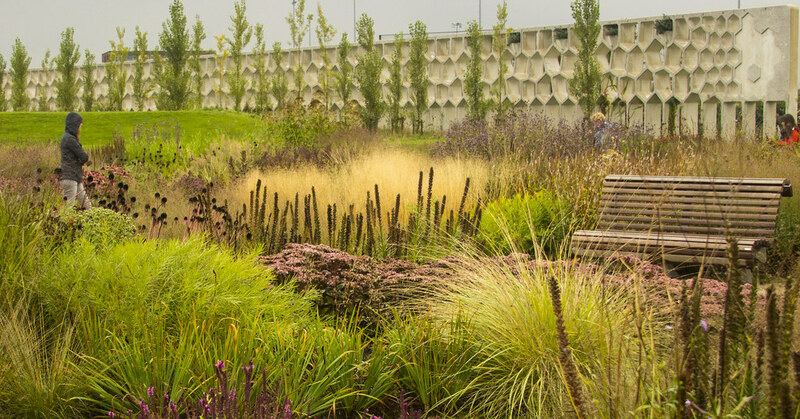 The grasses are not just beautiful in their own right, but provide a contrast to the darker, more defined shapes of other plants, throwing them into contrast and ensuring that they will stand out, rather than get lost amidst visual clutter. That brings us to patterns found in nature. In the photos above, as our eye moves from close-in to a wider vantage, we can see pattens emerging...ribbons of different plants ebbing and flowing, following topography and highlighting it. We may not even be aware of the patterns, but we notice them subconsciously, as our brains try to find order amidst chaos. In the three examples above, you can see the same motif, created in different ways. Soft, undulating waves of land and plants, gently flowing into each other create a calm, serene landscape. This is a pattern, a landscape motif, that most of us have seen repeatedly in wild areas around us throughout our lives, so it reads as “natural” to us, even if the plants used are different. 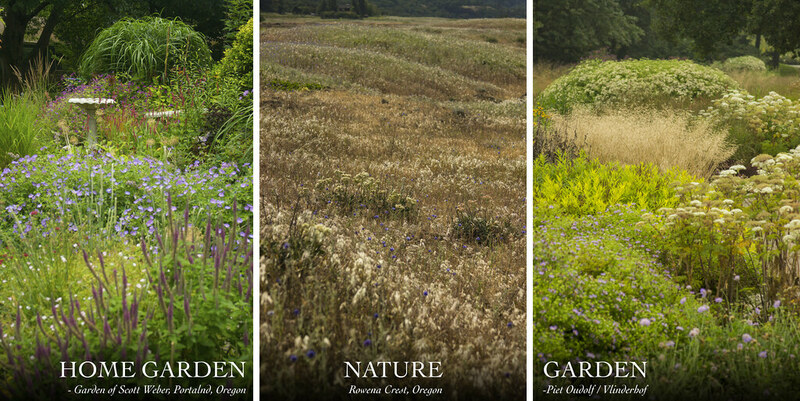 Neither garden is trying to literally recreate the natural landscape, but, rather, take visual cues from it. Here again, we see a planting imitating a pattern seen in nature, where different plants form colonies and then communities, which move about a landscape in dots and bands, almost like brush strokes on a canvas. Of course, all this talk of patterns, communities and motifs can sometimes lead us to forget that, regardless or what style is used, a well-designed garden should be beautiful and exciting. Through a camera's lens, we can see how different gardeners, working in different locations, and with completely different plants, can still come to a similar outcome. Good design is good design, right?!? Of course, this is just my own musings about the style...and, to be sure, it just scratches the surface of my thoughts on the matter...let alone the varied interpretations of other gardeners and designers around the globe. At the end of the day, the important thing is to immerse ourselves in our gardens and have a good time. 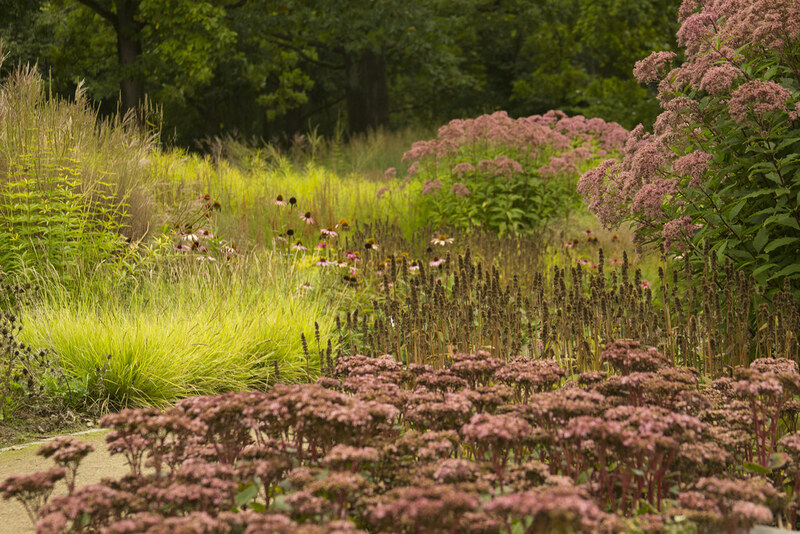 If you've ever been intrigued by Oudolf or other nature-inspired plantings, I hope this rambling post might inspire you to take the plunge and give it a try.